Please visit my woodworking web site and see some of the wonderful wooden cutting boards and jewelery boxes I have personally made. These items make great presents and corporate gifts. Greg began building furniture and refinishing antiques in his 20’s. He has had a successful career as an author, professional speaker and business consultant. He now lives in Chapel Hill, NC with his wife. He has three grown children and three grandchildren. This training program is designed so you can either purchase the training materials, certify one or more of your staff members to teach the program, or we can come to your location to conduct the training program. 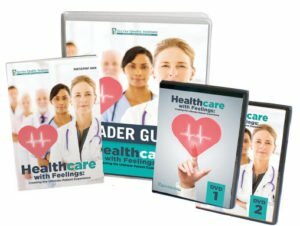 Healthcare with Feelings is our newest customer service training program for hospitals, clinics, labs, admin and healthcare workers in general. Healthcare with Feelings will help new and experienced staff members deliver a powerful impact on employee performance and the quality of care your organization provides. Providing quality customer service is more important than ever before. Our healthcare customer service training programs are specifically designed for hospitals, physician offices, clinics and medical practices in the healthcare industry. Healthcare with Feelings is about adapting to change by providing the best patient care possible. Today’s healthcare consumers are shrewd, informed buyers— and if or when they have a poor experience, they will not hesitate to spell out every painstaking detail in an online forum post or publicly vent their frustration. The patient will decide if it is easy to do business with your practice and they expect to be treated with respect, compassion and dignity. The essence of healthcare is caring, but caring is more than just a word. Caring is how we feel about our patients. It’s how we provide services, treatment and support. Caring means more than simply being physically present. It means taking you patients’ feelings into account and adapting your care to reflect their needs as well as their desires. The crucial first step in developing caring relationships is to consider patients and staff as special—and to treat them that way. 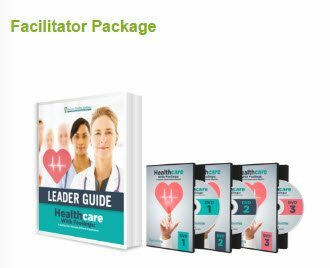 Leader Guide – A Leader Guide is a user-friendly guidebook that enables ANYONE to lead a group on Feelings. The sections are clearly marked for the leader, prompts the leader to start the video, enables the leader to facilitate group discussions (no need to answer questions even! ), and provides exercises for the group. We make being a Leader SIMPLE! experiential learning. The principle objectives are to change attitudes and behaviors, to teach leading-edge customer service skills, and to build morale and teamwork. Participant Book – An easy to read book for Participants. Each book contains key concepts about the Feelings program along with thought provoking quotes and interactive exercises. Not only will a participant find value in this material for their job, but learn invaluable lessons. Performance Standards – A valuable four page evaluation sheet to monitor employee improvement. Quality Technique Card – A Glossy 3×5 color index card highlighting the key Feelings topics as an easy daily reminder for Leaders and Participants. Certificate – Each Participant will receive a color certificate with their name on it upon completion of the Feelings program. 100% Money-Back, LIFETIME Guarantee ! If you are not completely satisfied with ANY of our products, if you do not feel your company’s customer service level increased, if you do not feel your company is increasing its revenues based on our product, return it at any time for a full refund! Only 19% of workers said they were “satisfied” with their jobs. Right Management, a subsidiary of the giant staffing firm ManpowerGroup, just released a new snapshot survey that underlines the dissatisfaction among American workers. At a time of high unemployment, lackluster job growth and major uncertainty in world financial markets, many employees feel stuck in their jobs, unable to consider a career move even if they’re unhappy. 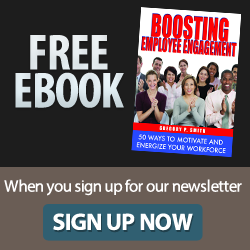 Staffing firms and consultants release employee engagement and loyalty surveys periodically. The news on this front has not been good for some time. In November, I reported on a more in-depth study, a Mercer survey of 30,000 workers worldwide, which showed that between 28% and 56% of employees in 17 spots around the globe wanted to leave their jobs. In the U.S., 32% said they wanted to find new work. That’s about half of the 65% of respondents to the Right Management survey, who said they were either somewhat or totally unsatisfied. Continued via New Survey: Majority of Employees Dissatisfied – Forbes. Have you ever had a bad hair day? How about a bad Hawaiian shirt day, bad hat or bad shoe day? More and more companies are putting together contests on the ugliest dressed. Another company sponsors an annual “turkey bowl” contest. Employees pick an open space, take a frozen turkey, and try to knock down as many empty wine bottles as possible. This is not evidence of companies’ gone nuts, but tactics used to ward off a serious business problem. The biggest problem facing business today is motivating and engaging the workforce. The other problem starting to pop up is employee turnover. Today’s mobile employees are loyal only to themselves, and jump ship for better benefits, higher pay, and greater opportunity. At Phoenix Solutions Inc. employees award an “employee dollar” to fellow employees who do something special or exceed company expectations. Each month the employee with the most dollars gets movie tickets, dinner, and a plaque with their name as Employee of the Month. Herb Kelleher, the former CEO of Southwest Airlines, combined fun and hard work into something he calls “management by fooling around.” At the nonconformist airline, everything?from the tickets and boarding passes to the casual dress and occasional costumes attendants wear? clearly demonstrates that something is different. A Milwaukee office manager doesn’t just give out paychecks on payday…employees also receive a “Payday” candy bar with their check. A Miami-based business owner rewards her employees with parties, expensive dinners, chauffeured shopping sprees, spa sessions, and cooking lessons with Chef Paul Prodhomme. She lets her employees decide what they want, then figures out how much their package costs and also how much additional business they have to generate to cover those costs. Employees at PeopleSoft, Inc. have not forgotten the day that former CEO David Duffield danced the Macarena in front of 500 happy coworkers. Duffield does not act like a boss. His office is a cubicle, he answers his own phone and opens his own mail. Annual employee turnover is three percent or one quarter of the national average. Employees who earn outstanding service awards get either $500 in cash or stock options. United Services Automobile Association (USAA) provides blank Thank You note stationary to their workers for a program called The Extra Mile. Employees are encouraged to say “Thank You” to each other for the help they receive at work. The most surprising thing happened on the first day USAA printed the notes. . . They ran out! The company couldn’t keep up with the demand. Everyone enjoys eating. At Texas A&M the first Friday of each month is celebration time. Everyone brings food to share, and they celebrate birthdays for that month as well as work anniversaries. Surprise Celebrations Often it is the unexpected and informal that employees enjoy as much as formal awards. Conduct frequent, unannounced recognition and award celebrations, such as having a pizza party. If you don?t know of a reason to have a get-together for the work force, invent one. Hal Rosenbluth, CEO of Rosenbluth International (the nation’s fourth-largest travel services company) believes in creating a fun work environment. He starts by hiring nice people since he believes nice people like to work together and they like to have fun. Officers dedicate every Tuesday afternoon to serving high tea and discussing corporate values and other matters of importance to new recruits at the company’s Philadelphia headquarters. There’s a toll-free 800 number for any associate to contact Rosenbluth. Sometimes it’s fun to recognize an employee’s goof. Try the “Faux Paus Award,” a plaque or trophy passed around the organization at a monthly social event with the current recipient?s name engraved. The ?keeper? of the award is responsible for selecting the next deserving recipient. Even though you took time during the work day to thank the employee who went above and beyond. They go a step further and call them at home after dinner to say thanks. You might be surprised how much this can mean. The Human Resources Department of Nations Healthcare, Inc. initiated a “Breakfast with the President” program to improve communications between employees and the CEO. Each breakfast begins at approximately 8:15 a.m., with coffee and biscuits served by the staff, and ends when the discussion ends. Results: higher morale and a sense of open communication. Hiring the wrong employee is an expensive mistake. For example, let’s say a professional services firm recruits and hires a new customer service representative (CSR). After 2 months, the manager realizes he made a bad decision. The employee is terminated. This is the example used in a recent report by McLean & Company. They placed the cost of hiring the wrong employee at about $12,000. Here’s how they derived the estimate. The analysis McLean & Company used is not very different from the multitude of other articles and forms available with a simple Google search. But it’s a good reminder about the high cost of hiring poor performers, especially since hiring trends are up and many hiring managers are unprepared. You should notice that these costs might just be the tip of the iceberg and rise when candidate travel costs, relocation costs, signing bonuses, litigation costs, and benefits are incurred. Hiring the wrong employee is also the mistake that keeps on giving. After this CSR (or any other employee) is let go, the organization has to start recruiting all over again. The cost to replace this employee just keeps mounting even after he or she is gone. In addition to the recruiting costs ($3,000), there are a number of soft and opportunity costs that add up. Manager’s time spent dealing with HR about the under-performing employee, discussions with the employee, and documenting his or her performance. HR’s time spend coaching and advising the manager about performance management and legal implications of termination. Lost productivity due to missed deadlines, unfinished projects, and missed sales. Disjointed customer service. Customer fulfillment, engagement, and service is disrupted or less than desirable when management and HR’s energy is redirected toward poor performing employees instead of top performers and customers. Damage to reputation. The terminated employee will almost certainly spin a different story than the one told by the employer. And word of mouth travels fast, especially if the employee is active on social network sites. via Hiring the Wrong Employee is the Mistake That Keeps On Giving | Workforce Trends Creating The Perfect Labor Storm. Businesses and business leaders must be one step ahead of change. Whether you run a small business or a large corporation, you need to be an agent of change. Unfortunately, many organizations suffer from a lack of leadership. Leadership is both an art and a science. A leader gets others to achieve goals by providing purpose, direction and motivation. The ultimate goal is to lead others to a destination they would not go by themselves. Rapid changes in technology, an uncertain economy, intense competition, strict regulatory requirements and an increasingly diverse workforce are challenges forcing organizations to adapt quickly to new circumstances. A manager tends to maintain the status quo; whereas, a leader creates and manages change. Unfortunately, many people who were successful in the past do not possess the skills and competencies needed for success today. These varied factors require strong leadership skills—the ability to lead, not just manage. Famed management consultant and late author Peter Drucker put it bluntly by saying, “Every organization has to prepare for the abandonment of everything it does.” Only through innovation will a company survive in today’s rapidly changing environment. Change in the business world was at one time orderly and incremental. In a routine or a traditional environment, managers do well; however, change is much more dramatic today. Today’s business world demands a leader willing to facilitate change and encourage innovation within his or her company in order to be successful. Retired General William Livsey said, “You can assign a person to a leadership position, but no one will ever really be a leader until his appointment is ratified in the hearts and minds of his soldiers.” Leadership is earned. It is not based on titles, position or rank. The business that neglects its people and treats them solely as expendable resources stands to incur the greatest loss. • Read leadership books. Talk about your interest, new awareness and commitment to new ideas to conduct your business. • Ensure that you make yourself visible in all training courses/programs supporting this new direction. Consider becoming an instructor or teaching a class to the people in your company. • Encourage the management team to do the same — become role models. • Avoid sending mixed signals. Evaluate your actions and priorities to insure those actions support the new vision. • Eliminate barriers and bureaucratic procedures that block the way of progress. • Get personally involved with improvement projects, teams and task forces. • Spend time with customers and suppliers, as well as with employees and staff discussing these issues. Make these sessions informal, open and friendly. • Keep an open mind to new ideas and better ways to do business. Be willing to take a few risks just to get more people engaged and involved. WHO IS SPEAKING AT YOUR NEXT MEETING? Keep us in mind if you need a speaker, trainer or facilitator for an upcoming meeting or conference. In addition to Greg, we have several highly capable individuals to provide a wide range of services. Visit our website for a list of Greg’s dynamic keynotes and workshops. Contact Cathy for additional information. Here are a couple of my favorite team building activities and meeting icebreakers you can use to energize your meetings. Have you ever made a wrong hiring or promotion decision? Do you have people who have difficulty communicating with others? This webseminar explains how to integrate DISC and other online assessment tools into training, selection, communication and professional development applications. People are unique and have different temperaments and personalities. These differences have a direct impact on how we behave with each other, communicate and perform. Interviewing and resumes are becoming less reliable. Assessments provide you an unemotional evaluation of an individual’s behavior, attitudes, values and talent – qualities difficult to judge in an interview alone. • Learn how to avoid a bad hiring decision which can cost 2-3 times the person’s annual salary. • Learn the skills, processes and the knowledge you need to identify and hire top performers each and every time — those that will perform in the top 20%. • Give feedback to people in a style they can understand and accept for improving performance and accelerating professional development. 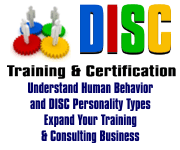 • Reduce stress, conflict and improve communication between individuals and departments. • Learn how to identify the emotional intelligence, strengths and abilities of individuals and know which jobs people are best suited. • Predict an applicant’s success on the job before hiring or promoting them. • Effectively measure and improve an individual’s leadership competencies. via Managing Personality Conflicts and Negative Attitudes in the Workplace. We'd love to hear from you! Please contact us with any questions you have or if you'd like to book Greg for a speaking opportunity. To purchase any of my books please visit my online bookstore.